The 2010 Clos Pegase Chardonnay is reported to have received a 93 point rating from Wine Spectator. It received an 87. Over the past few months I visited three different Tom Thumb stores, looking to rate a recommendation from one of their store employees. No luck. All three stores were absent any live person who could provide a recommended wine. At the last of the three, though, I noticed another customer read a shelf talker, the little sign with a description of the wine and often a review score, and then put that wine in her basket. It hit me like guzzled port on an empty stomach: for many consumers, those little signs carry as much recommendation weight as talking directly with an expert. Upon closer look at the shelf talker of the wine he chose, I noticed it was wrong. According to the text, the Clos Pegase Chardonnay received a rating of 93 from Wine Spectator. I took out my iPhone and looked up the wine’s rating on Wine Spectator’s mobile site: it received an 87. The Artist Series Reserve, a different Chardonnay from Clos Pegase, received the 93 that year. A few bottles down I noticed another shelf talker, this one on the 2008 Provenance Cabernet claiming a 91 rating from Wine Spectator. Again, the information was incorrect. Wine Spectator did give Provenance a 91 rating, but it was for the 2008 Winemaker’s Reserve Blend. What was being sold by Tom Thumb was the 2006 Provenance Rutherford Cabernet. A different vintage and a different wine altogether from the one that received the 91 rating. What did Wine Spectator give the wine that was actually being sold by Tom Thumb? An 88. According the shelf talker, the 2008 Provenance Napa Rutherford Cabernet received a 91 rating from Wine Spectator. It was the 2008 Provenance Winemaker’s Blend that received the 91 rating and the store was selling the 2006 Napa Rutherford Cabernet. 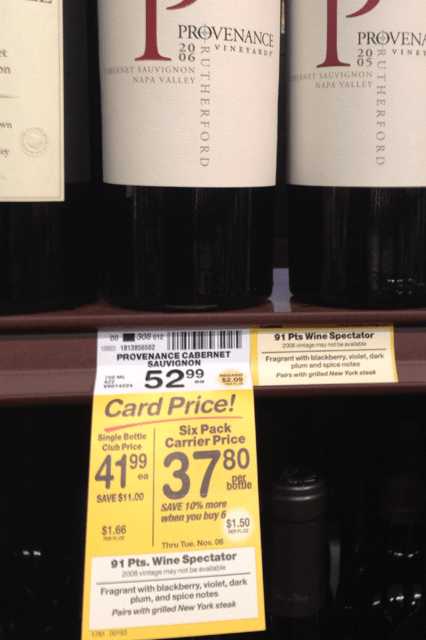 Tom Thumb isn’t the only retailer to rely on shelf talkers to help sell their wines. You will see them at most wine stores. 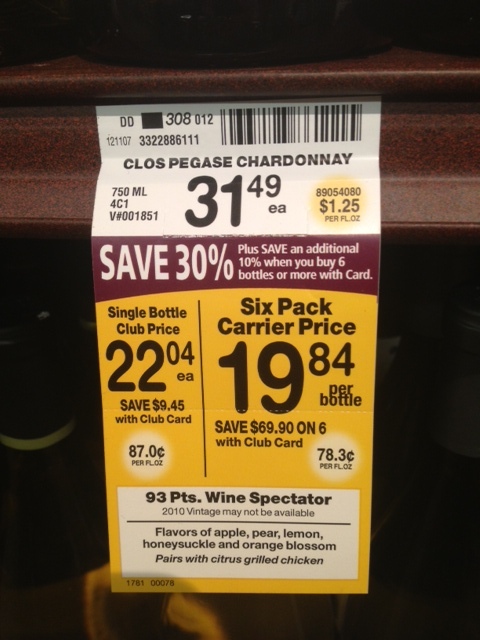 Shelf talkers may help sell wine, but in reality, most provide very little value to consumers. Even when they are factually correct, shelf talkers can still be misleading. A Costco tag for the 2010 Chateau Domeyne Red Blend trumpeted a Wine Spectator rating of 89-92. That certainly sounds impressive, but it fails to note that the score is the anticipated range that the taster believes the wine might receive based on an early barrel tasting of the wine, not a rating of the finished product. Barrel tasting ranges don’t always pan out as high as expected. In the winemaking process, much can still go awry from barrel to bottle to shelf. To lead consumers to think the barrel range is a score actually given to the wine sets false expectations. I don’t think the talkers in themselves are a bad thing, just the way many retailers employ them. Here are three things retailers could do to make sure shelf talkers are of benefit to shoppers. 1) Dump the digits. There are far too many reasons to discuss all of them in this post, but suffice it to say that the 100-point scale (really, the 80 -100 point scale) does little to help consumers. Start with the fact that many of the ratings are based on what the reviewer believes the quality of the wine will be at its drinking peak, not on what it necessarily is at the moment you are going to buy it and drink it. These ratings may be based on an expert, but they are still just one person tasting the wine one time and in a long line of other tastings. How often does this match the average consumer’s experience? Finally, wine reviewers have figured out that giving inflated scores is a great way to increase their own brands. The retailers will always tout the highest score a wine received and the review source that gave the score will get a brand impression. The more top scores a reviewer gives, the more often that publication’s brand is shown in the wine aisle of a store. That brand frequency helps build the credibility of the reviewer, and with it the publication’s business. Muscular, mouthcoating and tannic, with dense loamy earth, dried berry, sage and cedar flavors, ending with crushed rock and asphalt. Muscular ending with asphalt? I’ve got to be honest, it sounds more like a mob hit than a wine. Separate this description from the 90-point rating on the tag, and I doubt many consumers would find the 2007 Meyer Cabernet appealing based on the description alone. The highbrow puffery is only there to prove the reviewer’s palate is discerning enough to justify the authority to score the wine. It really helps very few buyers. Short of invited guests asking for “something muscular that ends with asphalt,” the Costco description gives no help to consumers wondering what the wine may pair with or in what situations it may be best to serve. Amazon and SAS cemented book-buyer loyalty with the underlying recommendation engine system that powers the “Readers of this book also liked these books” feature. In an era of big data and content marketing, making relevant connections and connecting with consumers in language they understand would better serve the wine, the retailer and the consumer. 3) Tell us what you think. I get it. If a retailer posts a 92-point rating from Wine & Spirits Magazine and you don’t like the wine, the retailer can tell you to blame Wine & Spirits, not them. It’s nice for the retailer to have collateral that sells product, but doesn’t leave the retailer accountable. Again, that doesn’t help the consumer they are pretending to serve. I would rather see, in clear and plain language, what the Tom Thumb wine specialists think of the wines they sell. I would love to see a Costco pallet with handpicked wines that tickled the palates of its employees. I would love to see the retailer put some of their own skin in the shelf talker fermentation tank. Brilliant post, PK. Love your writing style and interesting to note that the mis-use of shelf talkers happens on the other side of the Atlantic as well. Thanks for sharing your post! I will start following your blog. Another great article on a tough situation. Most grocery stores and many wine stores do not hire people qualified to make wine recommendations so they rely on meaningless shelf talkers with even less meaningful numeric rankings. Sigh….the wine world is not consumer friendly. Its no wonder Cup Cake is the number one selling wine in the US.